Schlemiels come in all sizes, shapes, and colors. Rather than simply generalize about the schlemiel – which I, like Ruth Wisse, Sander Gilman, Hannah Arendt, Sidrah DeKoven Ezrahi, and a few other schlemiel theorists often do – I’d also like to take a closer look at all the different kinds of schlemiel so as to expand the horizon of schlemiel theory. I’m especially interested in how different writers from different time periods articulate this character. To be sure, the way they convey the schlemiel and his/her ways teaches us about how they approach the schlemiel. And the differences between these articulations – as well as the general trends – teach us a lot about this character and how it takes on different shades: sometimes s/he is adorable, other times s/he is irritating; sometimes s/he is an utter failure, other times s/he’s a partial failure; sometimes s/he’s redemptive, sometimes s/he’s not. But, to be sure, one can always say that the schlemiel is the odd one out. His/her oddity is manifested in an awkwardness that arises out of misjudging the norm or in misjudging this or that situation. On the other hand, the schlemiel’s oddity may not be manifested in awkwardness: he or she may be odd with out even knowing it. But how odd is s/he? What makes him/her odd? These questions inform the decisions that many writers, filmmakers, poets, and comedians make when portraying the schlemiel. And the decisions they make can and often do change the way we look at this character in this or that historical period. One writer who provides something of a new schlemiel – who evinces a complex form of oddity – is Gary Shteyngart. In this blog, I have written extensively on Vladmir Girshkin – the schlemiel of his first novel: The Russian Debutante’s Notebook. I initially found what I call Shteyngart’s “immigrant-becoming-American-schlemiel” to be quite a novelty. This new articulation of the schlemiel challenged the literary critic Irving Howe’s claim that, with the end of the waves of post-pogrom Jewish-European immigration to the USA, Jewish fiction would have little to draw on. To be sure, Howe, saw great creativity in the struggle Jews had with assimilation. Their liminal state prompted many Jewish writers to create fiction which often had a modernist flavor. Now that we are in a “post-assimilation” era, he thought that was a thing of the past. However, Shteyngart shows that its not. His characters are Russian Jews who have come over to the United States in the post-Communist Era. And, because they are somewhere between worlds and have a hard time succeeding, they provide us with a new articulation of the schlemiel. However, what I found disappointing about Shteyngart’s first novel is that it actually traced a story arc that differs considerably from the story arcs we find in much literature on the schlemiel (from Sholem Aleichem to Saul Bellow). This starts with what I called a “partial transformation.” And when he flees America for Eastern Europe, this transformation takes on more of a reality (as he becomes more masculine). At the end of the arc (the epilogue), the main character, Vladmir, decides to live a normal life. Since he becomes a dad, and because I find the gradual displacement of the schlemiel in this novel to be disappointing, I call this a “dad ending.” After assessing the novel, I turned toward a generalization about the schlemiel and its arc, which can be found in the work of Hannah Arendt. In my view, Arendt and Shteyngart (at least in this novel) were situating the schlemiel on a path that I did not agree with since I find nothing wrong with the schlemiel being an “exceptional” (as opposed to a “normal”) character. With this reading in mind, I have decided to give Gary Shteyngart another chance. 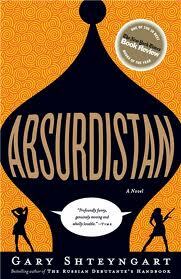 To this end, I have chosen to make a series of close readings of his second, follow up, novel: Absurdistan. Like any reading, I’d like to start at the beginning, which Shteyngart makes a prologue rather than a first chapter. It’s entitled “Where I’m Calling From”. Perhaps because I have read too much Freud or have a penchant for history, I can’t help but think of the expression the “the past is prologue” whenever I see a prologue. Regardless, I think it is a good intuition to take this thought to heart when reading this prologue. And in this novel it “pays” to do so since the main character – Misha Borisovich Vainberg – is a narrator who is interested in telling the reader how he screwed up. And this, to be sure, is one of the schlemiel keys to this novel. But the question that interests me is whether such reflection means he is, so to speak, beyond his schlemiel character and situation. Will he, like Vladmir in The Russian Debutante’s Notebook, undergo a transformation from a schlemiel (a man-child) into a man in the Epilogue? As I read this novel, this question lingers. Indeed, is “man” the right word or is schlemiel the right word? So…where he is writing from (a place of Jews where he feels comfortable with – an important point, as I hope to show, since he has problems with some kinds of Jews; namely, Hasidim) is not where he wants to be. He wants to be somewhere else far from these “pre-historic” origins (which he is not totally at odds with, but cannot settle with). One can end the prologue here, but that would be a mistake. After all, he’s not there. He’s in a Village of Mountain Jews. And, in addition to that, he says that this is a novel about love AND about “being-had.” These last two elements, in contrast to his emphasis on love as the underlying meaning of the book, teach us that this is much more than a novel about love: its also a novel about Jewishness and the schlemiel-who-is-had. This combination makes for a nuanced schlemiel character. What I like about this prologue is the suggestion that we read Misha – and the schlemiel character – in terms of a tension between a consciousness of being-had, Jewishness, love, and New York City’s tension with Absurdistan. This makes for yet another Immigrant-Become-American-Schlemiel story arc. However, the question is whether or not it ends with the schlemiel it starts off with in the prologue: a schlemiel-in-love, a schlemiel-who-has-been-had, and a schlemiel-in-search-of-home.